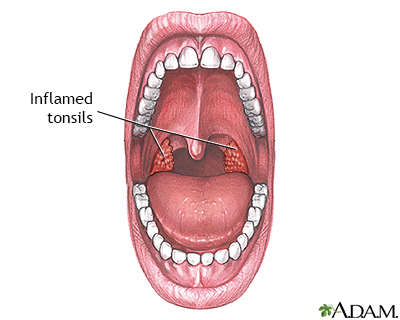 Tonsil glands are located in the back of the throat. They contain immune cells which fight infection. 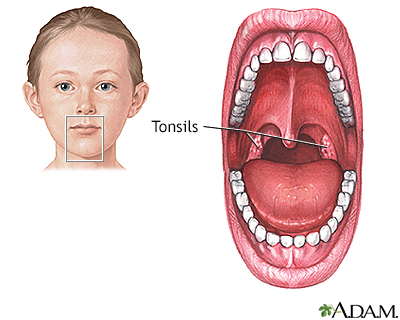 Tonsillectomy is advisable when tonsillitis attacks are so frequent or severe that they affect a child's general health or interfere with school, hearing, or breathing. However, tonsillectomies are thought to be done more often than necessary, so a second opinion should be obtained when there is any doubt. 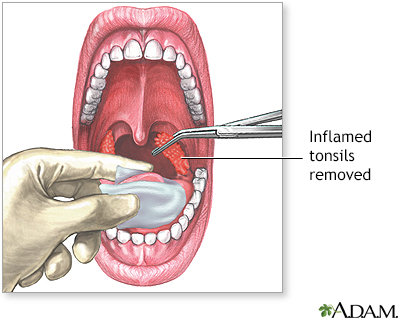 Tonsillectomy is advised if the tonsils are enlarged and obstructing access to the adenoid during an adenoidectomy operation, or the physician suspects the presence of a tonsil tumor. Under general anesthesia, the ear-nose-throat (ENT) surgeon holds the mouth open and pulls the tongue forward to reveal the tonsils. The tonsils are pulled away from the back of the throat and then removed by being cut away. Bleeding is controlled, and often the cut heals naturally without stitches. Patients are generally observed in the hospital for between 12 and 24 hours after surgery. Removal of the tonsils is not known to cause any problems later in life.